Disclosure: This post was bought to you buy JUSTBLOOMbox. All opinions stated are genuine and my own. I am big on healthy and I am big on happy. I believe in taking good care of myself, and taking good care of others. I have ambition, gratitude, and faith. I am a woman who is over 40, 43-years-old to be exact, and I am loving every minute of it. What a nice box full of goodies and all geared to women in the best time of their life. This would make a great gift for many of the women in my family. I could really enjoy a gift pack like these! Especially the essential oi! What a lovely box of goodies this would make a lovely gift. Now this sounds like a fabulous box! Even though I'm not quite 40, I would love it for myself! I think this is such a cool idea. I totally want to order one for my mom for Christmas. She would get a kick out of all the little surprises in there. I think I need one of these boxes for myself! I will have to hint around to my kids to get me a subscription for the holidays. Great sounding box--maybe I can convince someone to get me a gift--I am way over 40!! Sounds like a great box! I will definitely have to look into this for the Holiday Season. Thanks for sharing! This sounds like a really great box! I will be looking it up again when I get a little older. My skin is need of love now, so I will be doomed by then! What great products for women to take care of themselves. It is important that we pamper ourselves. The Just Bloom Box sounds like something just about any lady could appreciate. That is sweet! At least there is a subscription like that for women. sounds like a great box! I will have to check it out! What a great box! It looks amazing! Sounds like a great box! I am not quite there yet but will be before I know it and I think it is important to care for yourself no matter what age. From BabsProjects. This Just Bloom box sounds like a great product. It would make a great gift especially for the holidays. I think these companies are realizing how nice it is to get snail mail, and how rare - these box ideas are awesome! WOW what a fabulous array of items! Being 40 something I love the whole thing. I agree that that would make a great gift...I will keep it in mind! Love your first sentence-I am big on healthy and happy myself! 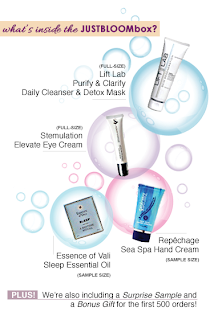 You had me at eye cream! If I could get eye creams in every subscription box, I'd be a happy girl. I'm not quite 40 but I love this idea, there are some great products listed there!